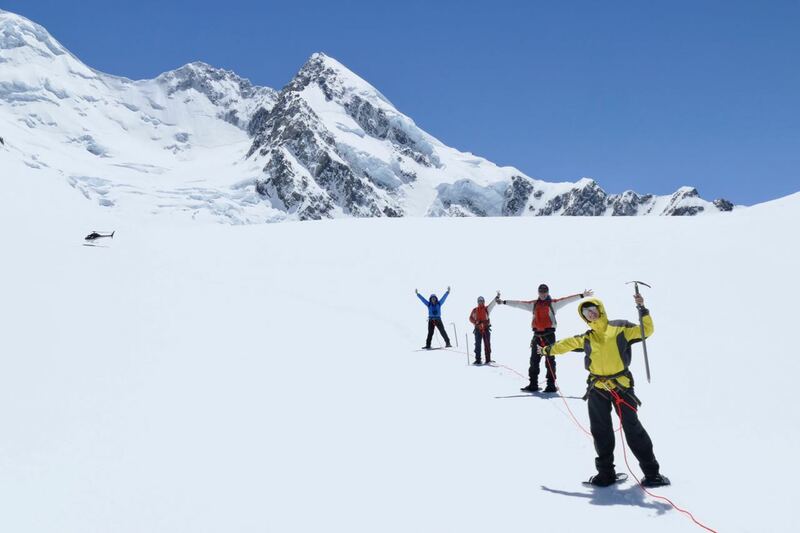 Our classic fly-in, fly-out Glacier Snowshoeing combines the excitement of exploring the mighty Tasman Glacier and two scenic flights. 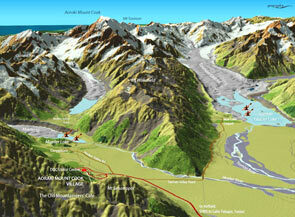 We fly by the famous Mt Cook Ski-planes to access the upper Tasman glacier region. Using these amazing aircraft, we are able to access and explore the world famous Tasman Glacier where it runs beside the biggest mountains in New Zealand, including Aoraki Mount Cook, and where it often creates spectacular snow and ice formations. Equipped with snowshoes and walking poles, we board our aircraft. Traveling high above the amazing icebergs of the Tasman Glacier Lake, we fly past the famous Hochstetter Ice Fall and the east face of Aoraki/Mount Cook. We land on the upper Tasman Glacier, surrounded by a group of the most impressive mountains in New Zealand. And this is where we begin our adventure and exploration. The landing site is situated on a remote and exceptionally beautiful part of the glacier, usually Upper Neve or Climber Col snow landing strips. 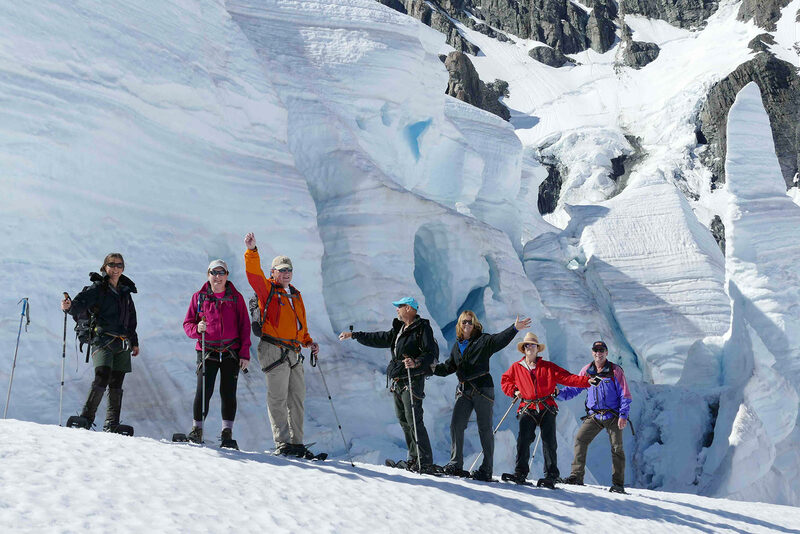 Outfitted with specially designed equipment for these snow conditions by your guide, the adventure of hiking on the glacier begins. 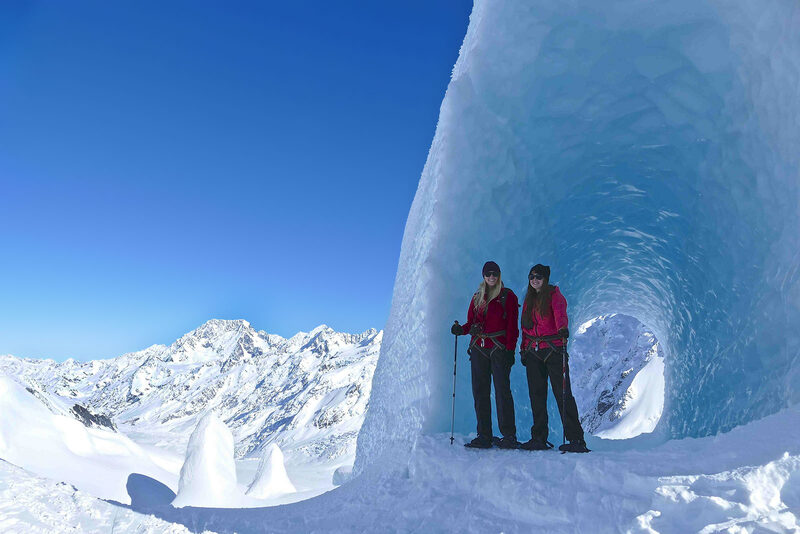 Your guide leads you on the glacier snowshoeing, which enables you to explore the amazing formations. 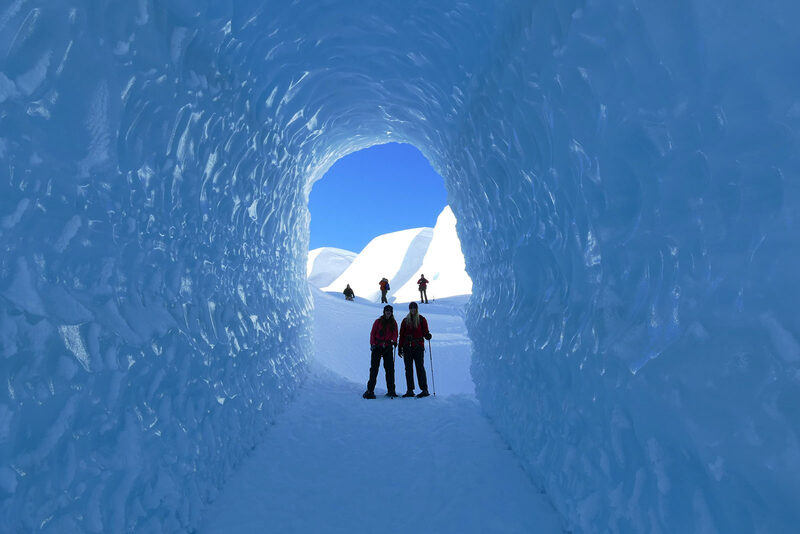 Your guide will also give informative facts about the Tasman Glacier, how it flows and what makes the crevasses and sink-holes appear, as he/she guides you around them. We meet at The Old Mountaineers’ Café Bar, next door to the DOC visitor information centre at 9am. Cost: $585 per person. Minimum of 4 people. There are so many exciting features on the Tasman Glacier and the scenery of the Southern Alps will impress you beyond expectations. Weather permitting, glacier walking time is about one to two hours. Please note that this is a natural and ever-changing environment, so there is no guarantee that specific features will be seen. Minimum of four people required for the trip to go ahead. Cost: NZ$585pp. This includes guide fee, aircraft flights, any gear you require, snowshoes, safety equipment, permit fees and GST. 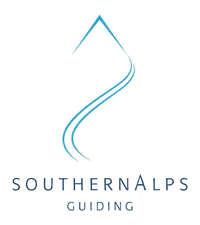 Contact: Southern Alps Guiding – ph: 03 4351 890. fax: 03 4351 293. 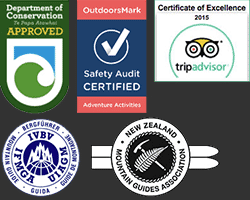 Email: mountcook@xtra.co.nz Situated at The Old Mountaineers Café, next door to the DOC Visitor Info Centre. We reserve the right to cancel or change any part of any trip. This could be due to adverse snow, avalanche, mountain or weather conditions or any other mountain related scenario. We have a strict 24 hour cancellation policy which means that if WE cancel the trip due to any of the above conditions will give you a full refund. If you decide not to do the trip within 24 hours of the trip start time for any reason (you sleep in, have a vehicle breakdown, an unexpected illness or injury etc) or we cancel your booking because of client unsuitability due to poor fitness or health there will be no refund. Please ensure you have travel insurance to cover all potential cancellation scenarios.